Happy Monday to you and welcome to Nonna's Craft Corner! Create a project with a Tux, Dress, Prom or Dance Theme. Remember, your project must have at least one Cricut cut! 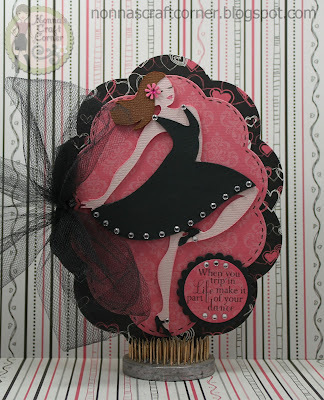 "When you trip in Life, make it part of your dance"
* Card base was created with Spellbinders Grand Nestabilities "Big Scalloped Circles"
* Dancer - Cricut cartridge "Shall We Dance?" I used the figure found on page 58 and cut it out at 6 inches. I cut out the body layer 3 times and glued them together for a bit of dimension on the card. * Even at 6 inches, the eyelashes and mouth just did not cut out properly. So, the eyelashes are drawn on with a marker and the mouth is painted on using Smooch. * I added gems to her dress and made a flower for her hair using a paper punch. * I used Spellbinders "Beaded Circles" to create a mat for my sentiment. * Sentiment is from the "Pink By Design" stamp set "Rise Above It All"
* A big, black bow made of tulle was the finishing touch for this card. And, isn't that sentiment just perfect? I love it! Thanks so much for stopping by today. I always enjoy your visits and the kind words you leave for me...they make my day! I hope you will stop by FCCB to see what the other fantabulous Design Team members have in store for you today. Then, be sure to find some creative time just for yourself. When you're done, link up your project with us at FCCB. I can't wait to see what beautiful things you create! It is that time of year...all those glamorous prom dresses have been seen about town. Your card is marvelous. Looks great! Tanya, you've outdone yourself my friend! This is just perfect--that bling is just amazing! And the tulle--WOW! Well done! Oh Tanya, this card is marvelous!! The shape and image are fantastic and that sentiment just tops it off perfectly. I've not heard that before and I LOVE it! I LOVE THIS CARD! The sentiment is perfect and I love the cute and the added bling. This card is FABULOUS! I love the colors and papers! The added bling is just the PREFECT touch! Perfect, perfect, card. So beautiful and feminine. Love all the bling. 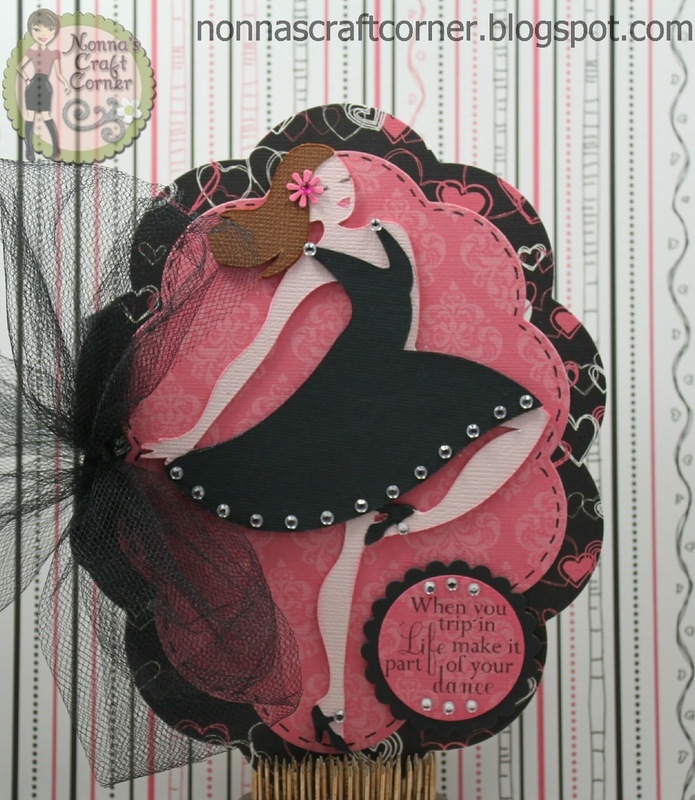 really nice whimsical design! love the shaped card! That is absolutely GORGEOUS!!! :) That cartridge is a Circle exclusive, isn't it? Too bad (for me, at least!)! Wow- that pops with color and energy! Love the figure and colors. Great sentiment too!! Great card! I have to tell you, when I saw the DT projects on FCCB this week, (they were all fabulous) yours was my very favorite!! I just love the image you used, it really seems like she is moving and I really love the sentiment you use. Fantastic card. I love the finishing touch with the tulle. The face looks great also. Wow, I absolutely LOVE this card!! The colors and cuts are awesome! I love the dress, so beautiful Tanya! How incredible is this card?!? Wow! The sentiment is amazing!!! Love it! This is a beautiful card! Every detail is so fun, I love the bling on the shoes, dress ..... Lovely Tanya!!!! Your card is gorgeous! You added just the right touches to make it really special.